The Amish Fur Elise High Dresser will be a welcomed sight at the end of your day. 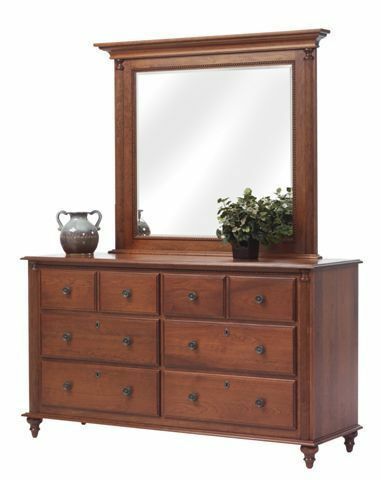 Warm, yet sophisticated, this Dresser is truly something special! The intricate details will have you wondering how this was handcrafted. Work like this truly makes our craftsmen earn our full respect. Simply take a look at the detail around the beveled glass mirror! The Fur Elise Bedroom is one-of-a-kind. Solid hardwood insets laced with intricately trilled moldings with pillars and epistals of like workmanship. Crowned with entablatures a full 3/4" thick. Deep-seated drawers are standard with concealed, fully extending ball-bearing slides. Make the Fur Elise your flavor with over 20 different standard stain colors and a handful of glazes, paints and distresses we have available. Choose from Edison, Vintage Illusion, or Modern hardware to complement your finish choice. Call us today with any questions on our elegant Fur Elise Collection at 1-866-272-6773. We have Amish Furniture Specialists waiting to help you. The Quality of our products is only matched by the quality of our customer service. Fur Elise - the bedroom you'll want to come home to. Fur Elise - the bedroom you'll want to come home to.